As the popular saying goes "Work hard and Play harder", people have to balance work and living life. If your a travel savvy like me who consider traveling as personal playing field then you should know about this free app. 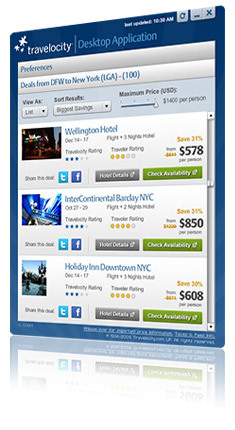 Travelocity Desktop application is a tool for travelers which can deliver Flight + Hotel hot deals directly to your desktop when the price drops to your favorite destinations, so you can negotiate a deal as soon as it's available. This free program is an Adobe AIR-based desktop app for Windows, Mac, and Linux. It saves your preferred city of origin and destination, then automatically refreshes anywhere depending on your preferred refresh duration (from 4 to 24 hours). You can also manually refresh the content anytime you like. Aside from hot deals alerts, you can also do other things like find hotels on a map in your favorite destinations to see exactly where you want to stay and share deals with your friends easily on Facebook or Twitter.